We do not collect ‘sensitive data’ about you ‘racial or ethnic origin, political opinions, religious or philosophical beliefs, or trade union membership’ – as specified in Article 9 of the GDPR. We may collect ‘sensitive data’ relating to an individual’s health, in the instance that a certain product is manufactured to cater for an individual’s disability. In some instances customer data will be held for up to 21 years to provide the information required to action guarantee, warranty or finance contracts. The right not to be subject to a decision based solely on automated processing, including profiling, which produces legal effects concerning him or her or similarly significantly affects him or her. 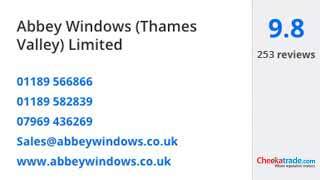 The Data Controller is Abbey Windows Thames Valley Limited, 50a Portman Road, Reading, Berkshire, RG30 1EA.